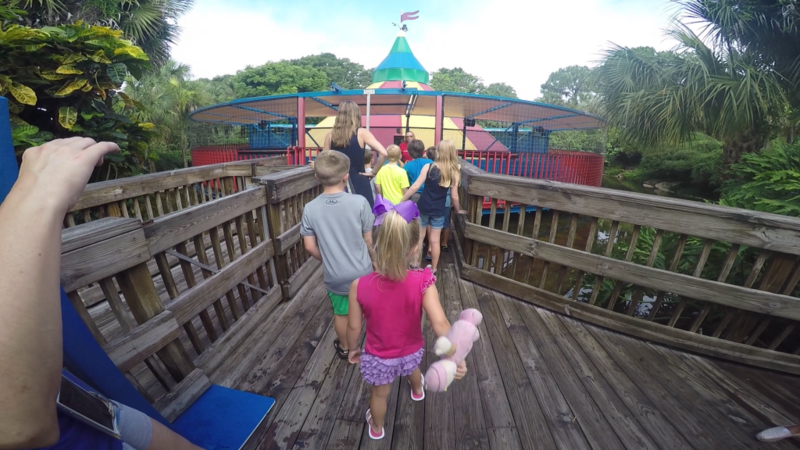 We recently took the kids to Winter Haven, Florida to spend a day at the Legoland theme park! In this Legoland review we will go over the rides, the food, Legoland ticket prices, and all things Legoland! Check out our Legoland theme park video above, and read our entire review below! 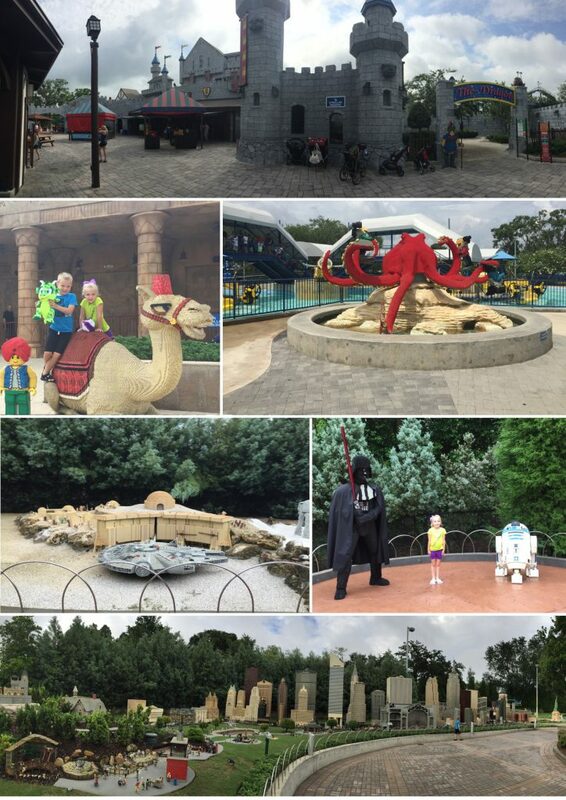 What we loved about Legoland Theme Park. Legoland is the perfect park for families with kids under 12 years old. Legoland is in a small town about 45 minutes from Tampa and Orlando, and sits on the old location of Cypress Gardens; one of Florida’s oldest theme parks. It’s super easy to get to Legoland and even easier to get into the park. There was never a long line at the public entrance to the park. We stayed at the Legoland hotel (click here to read our Legoland Hotel Review), which made the park even easier to enter. 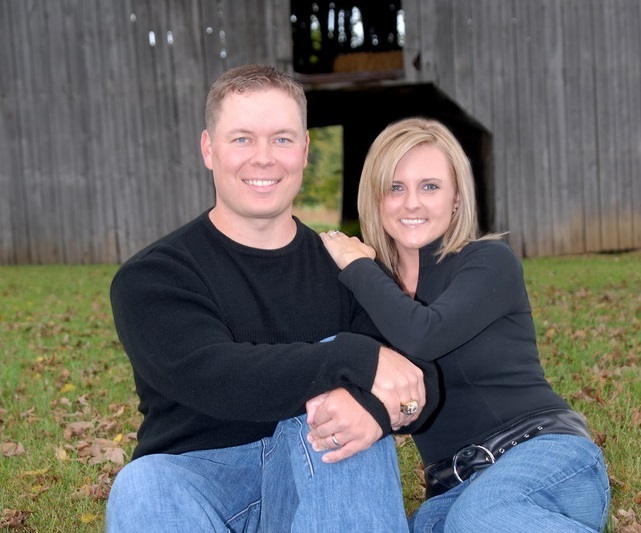 There is a private entrance for hotel guests that speeds up the process of getting to all the fun! The park also opens an hour early for Legoland Hotel guests, making it super easy to get inside and ride the attractions before the park gets crowded. Legoland Theme Park is a super easy park to walk. It’s mostly flat, except for a few hills leading down toward Lake Eloise. The park itself is big, but not huge like Disneyland or Disney World. You can be anywhere in the park in five to ten minutes. We always take a stroller to parks for when the kids get tired, but Isaac and Anna walked 90% of the time we were in Legoland. The park is so easy to walk, we often went back to the Legoland Hotel for a quick bite to eat or rest in between riding the rides. The size of the park combined with staying at the Legoland Hotel came in super handy when it rained on us the first day in the park. We ran back to the hotel, waited out the storm, then went back in for more fun! 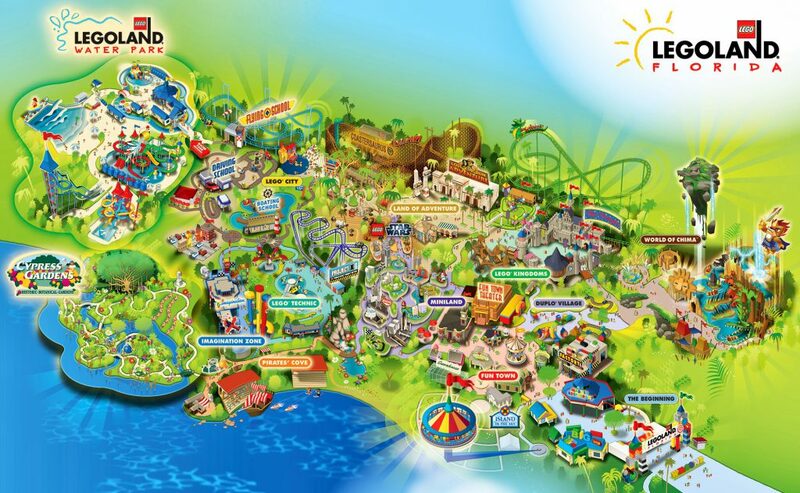 Legoland Theme Park has amazing rides and attractions for families with kids under 12. The rides are fun and can be enjoyed by kids, parents and grandparents alike. There are dozens of small carnival style rides all over the park, games with prizes, and the roller coasters are fun but not super scary. Kid 13 and older might not love the attractions and rides, but they were perfect for our 5 and 7-year-olds! Isaac is 50 inches tall and could easily ride every ride in the park. There were only a couple rides Anna Jo (our 5-year-old) could not ride. Our favorite ride by far was Flight School, a suspended roller coaster. the line at the Island in the Sky ride. Legoland Theme Park was never crowded the entire time we were there. We rarely had to wait more than 5-10 minutes for any rides. 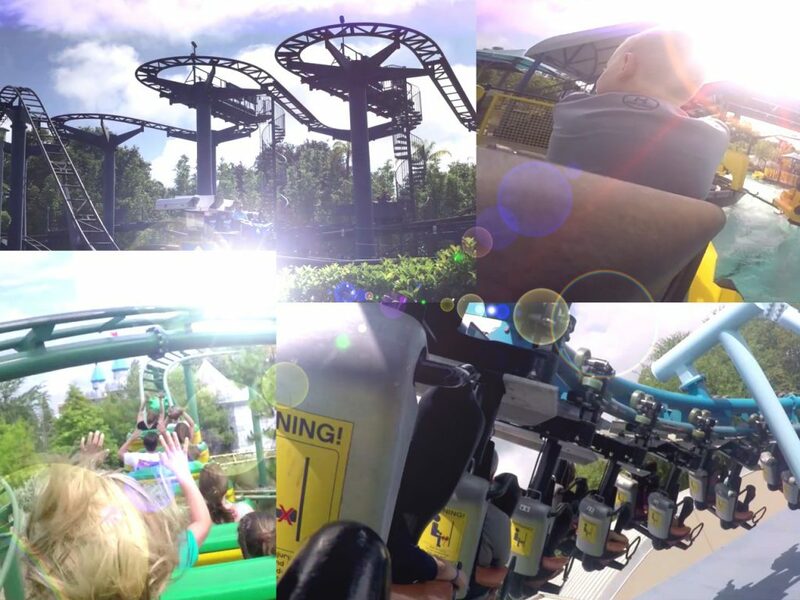 Even popular roller coasters like Flight School, Coastersaurus, Projext X Lego Technic Test Site Roller coaster, and the Dragon rarely had long lines. You could easily ride all the major ride in Legoland in a day with such short lines. 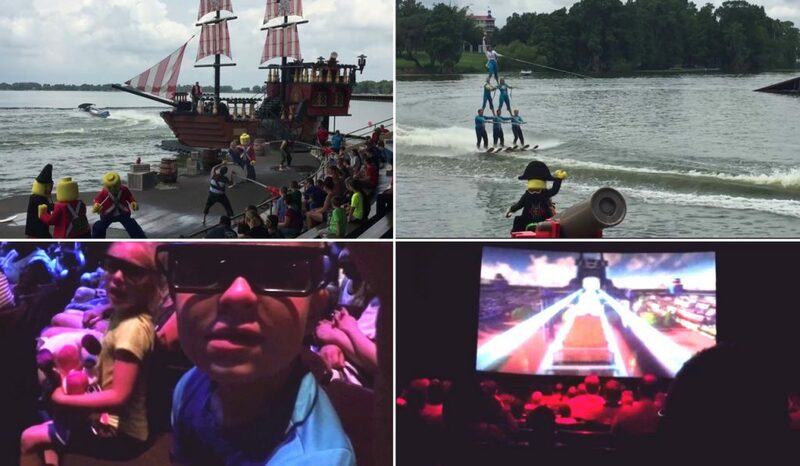 We loved the shows at Legoland Theme Park. The pirate boat and ski show was by far the most entertaining. The cast did a great job. The show was funny, the ski stunts were thrilling and the costumes were world class. It’s as good as any show we have seen at Disney or SeaWorld. The 4D Theater show was great as well. 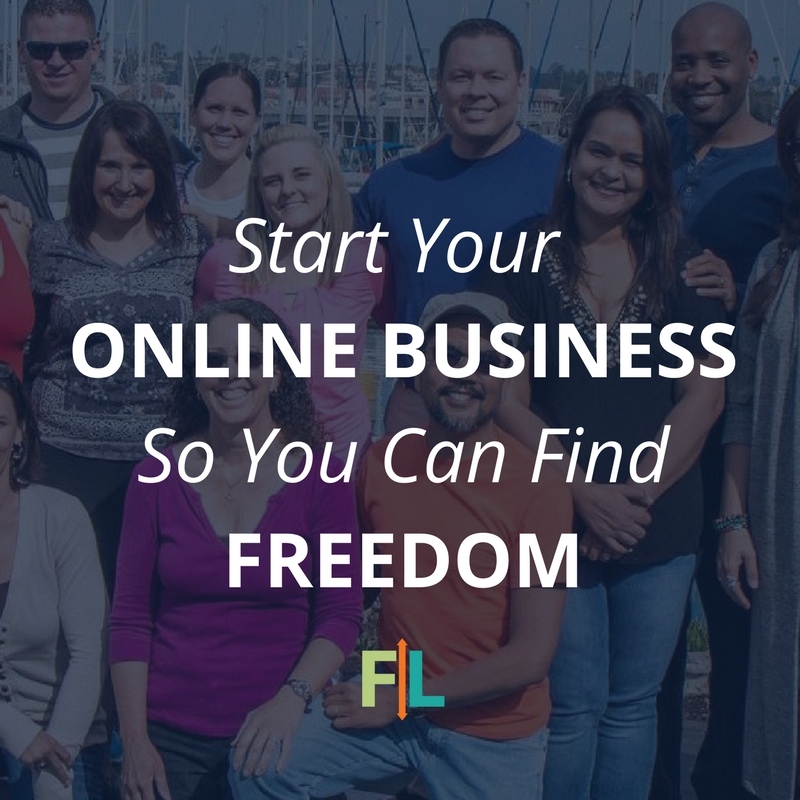 Not only was the video fun, but it also offers a great place to cool off for a few minutes in the Florida heat! 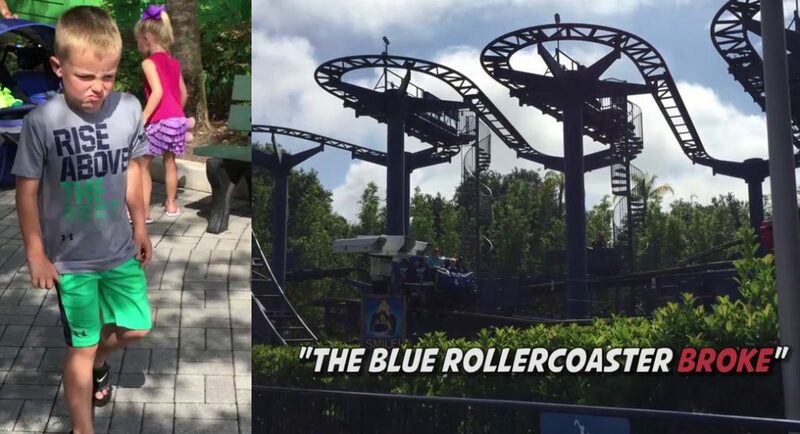 What makes the Legoland Theme Park amazing is the park itself. Hundreds of Lego sculptures made from millions of Lego blocks decorate the streets, buildings and rides themselves. There really are no words to describe how awesome all the Lego sculptures are. Lego statues are everywhere in the park. 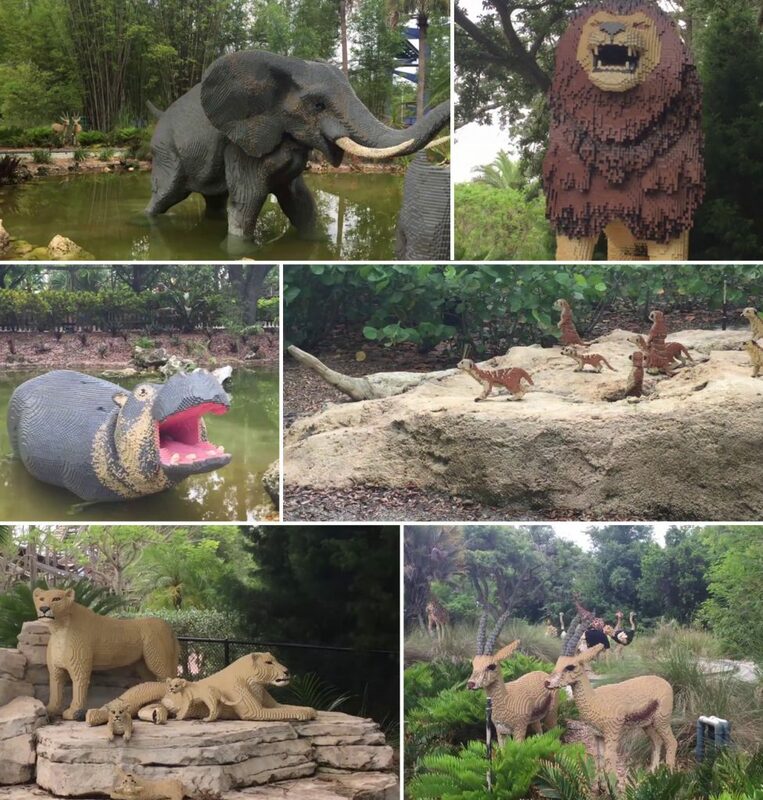 From entire city skylines (New York, Las Vegas, Paris), to world renowned landmarks (The Daytona 500, Kennedy Space Center), to animals big and small (lions, giraffes, killer whales, dinosaurs); the Lego sculptures would be worth the price of admission even if there were no rides in the park! There is even an entire section dedicated to Star Wars depicting famous scenes from the movies, including life size statues of Darth Vader and R2D2. Awesome Lego sculptures including the Kennedy Space Station and a race track. Realistic animals made out of Lego! Some rides didn’t work for some reason. 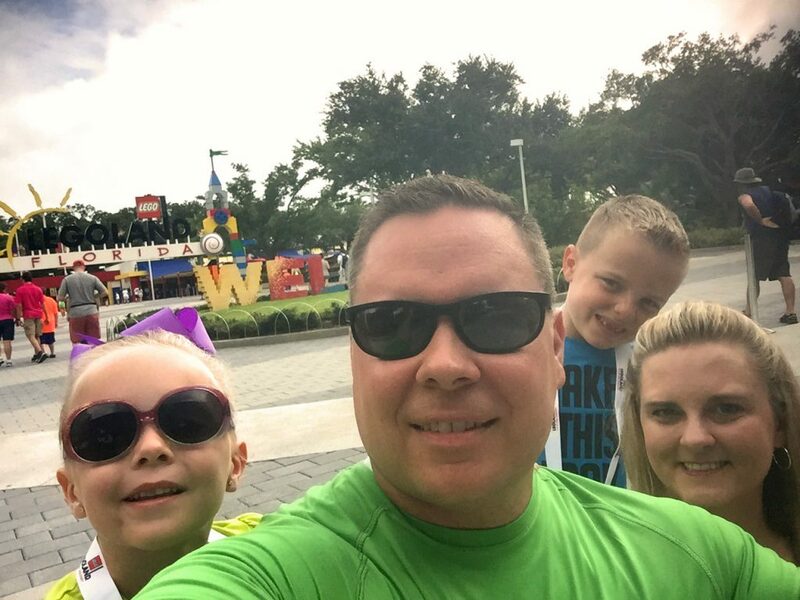 Legoland is an amazing place and we definitely loved our experience in the park. However, there were a couple nitpicks we had about our Legoland Experience. First, many of the rides would shut down during the day. We often waited in line, just to get up to the front and a ride would close for maintenance. Every ride opened back up, but it seemed like this was a more frequent problem in Legoland than other theme parks we’ve been to with the kids. Second, the park seemed a bit understaffed. Some shops and rides were unmanned even in the middle of the day. It was often hard to find a worker for questions like if we needed directions to a certain ride, etc. This was most evident in the food and drink stations, none of the concession stands or restaurants were open before 11am each day. We often got to the park as soon as it opened, so it was tough telling the kids to wait for their first drink near lunch time! Finally, take your own pictures. Legoland Theme Park’s system for storing your pictures is archaic compared to most modern theme parks. We had a piece of paper with a bar code. When we would ride a ride, or get our picture taken with a Lego statue or landmark, the picture taker would scan it. However, when we went to get our pictures at the end of the day… half of them were gone or could not be found. Apparently, the scan is a little more than a time stamp and the staff has to MANUALLY look for your picture around the time you rode a ride. They literally asked us “What time did you ride Coastersaurus?” LOL. Really? Legoland tickets cost $90-$110 per ticket to get in the park. Expensive, but not a bad deal when you consider that it gets you access to the Legoland Theme Park AND the Legoland Water Park (which is AWESOME). Make sure you order your tickets in advance (at least two days). The price is higher if you buy them the same day you use the park. We were able to save on our tickets as well because we stayed at the Legoland Hotel. However, the ticket savings were offset by the cost of the hotel (which is fairly expensive). Food prices in the amusement park were standard fare, we spent between $40 and $60 per meal. We felt the food prices inside Legoland were well priced compared to other parks. You will spend a lot of money on games inside the parks. There are games everywhere and the lure of those stuffed animals is too much for most kids to resist! So have some extra cash to win prizes for the little ones. By the time you buy food, drinks, slushies, prizes, get your face painted and buy pictures; you can expect to spend $100-$150 / day inside the park after you buy your ticket. Face painting and winning stuffed animal prizes! 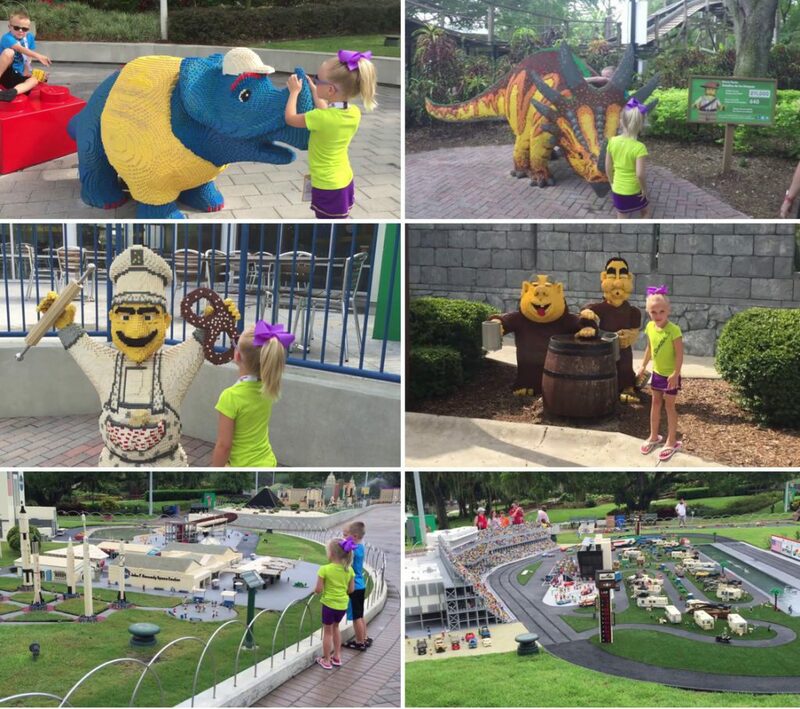 We loved the Legoland Theme Park, and highly recommend you visit the park while your kids are young. 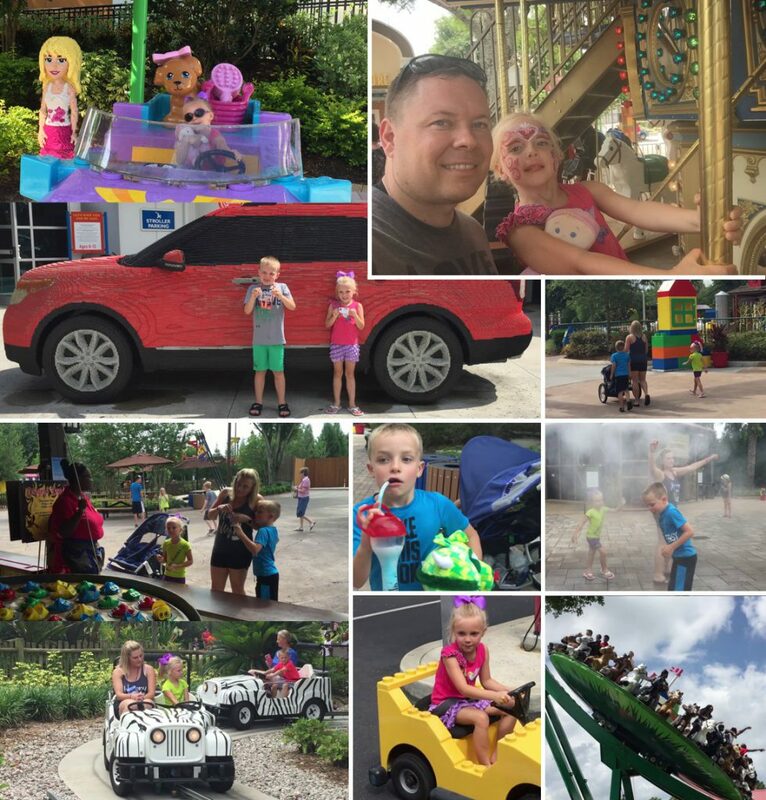 Legoland was one of the cleanest and funnest theme parks we have ever brought the kids to. 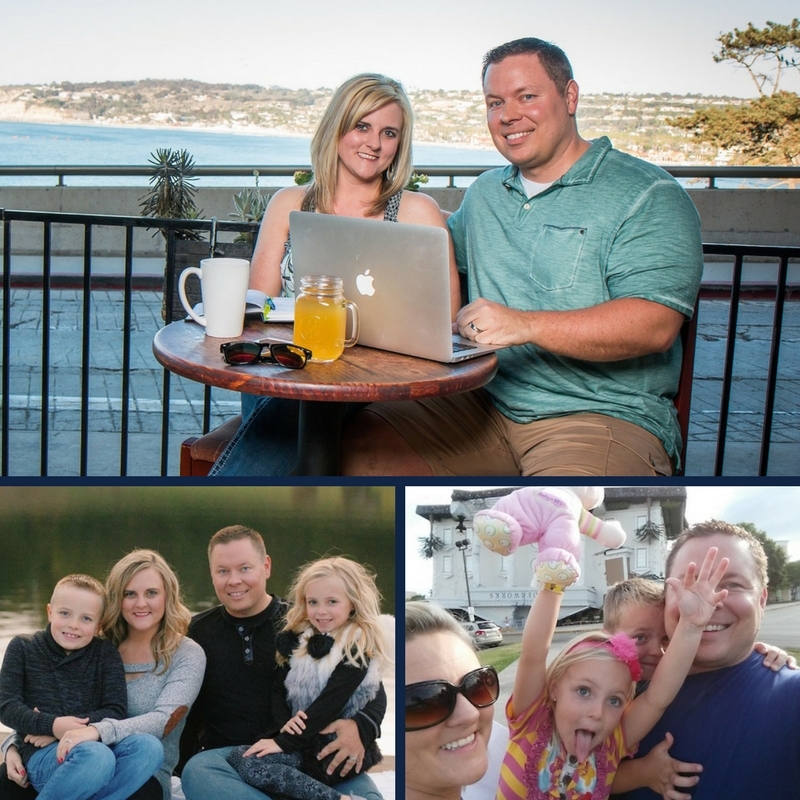 It’s the perfect place for families with small kids (under 12), and has a lot to offer for kids and adults. We definitely plan on taking Isaac and Anna Jo back again!